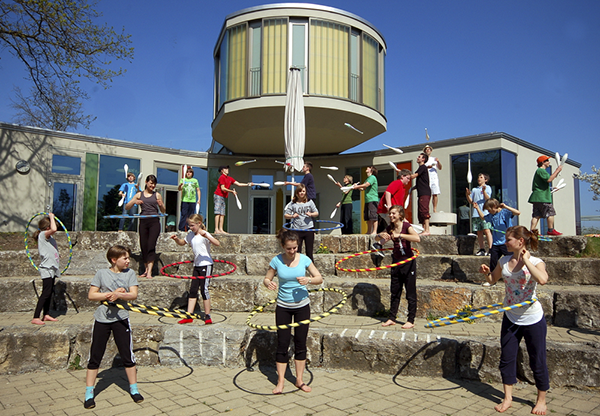 The Theatertage am See take place at the Bodensee-Schule St. Martin in Friedrichshafen and other places of performance. We do have almost ideal room conditions and can hold all events in one building. The performances will take place in the Little Theatre and in an Arena Theatre with 200 seats each. The two rooms have a fully developed light and sound technology. School Projects are taking place in schools and institutions throughout the whole region around Lake Constance. Plays, performances and projects of the groups TOB, Utobia, Zirkus-Akademie are taking place at various sites and stages. More informations can be found on their links and web sites. The Bodenseeschule St. Martin lies in the west of Friedrichshafen. Coming from Friedrichshafen on the B 31 turn right at the restaurant "Taverne Spicy Grill" into the Schützenweg up to the Zeisigweg. At the end of the Zeisigweg turn left and then you will see the school on the right. From Friedrichshafen - Stadtbahnhof, Hafenbahnhof and all othe bus stops take the buses to Meersburg. At the bus stop "Windhag/Seemoos leave the bus and walk on the footpath of the B31 to the restaurant "Spicy Grill", then turn into Schützenweg up to the Zeisigweg. There turn left to the Bodenseeschule St. Martin. Or you can take a bus no. 4 or 5 from the Stadtbahnhof directly to the Bodenseeschule. For traffic in town look at www.stadtverkehr-fn.de"